This has been a sheep-filled few weeks. I’m not sure when another Blue Dot piece has been so instantly as popular as this wooly creation. 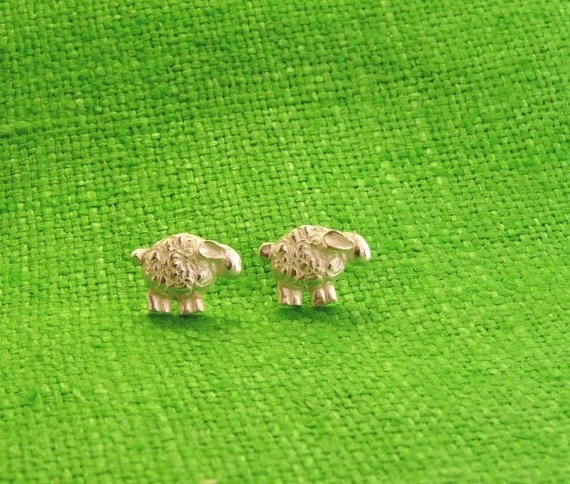 Then I received a custom order for these tiny sheep stud earrings to go with the necklace. I love tiny things and am always happy for a reason to make them. 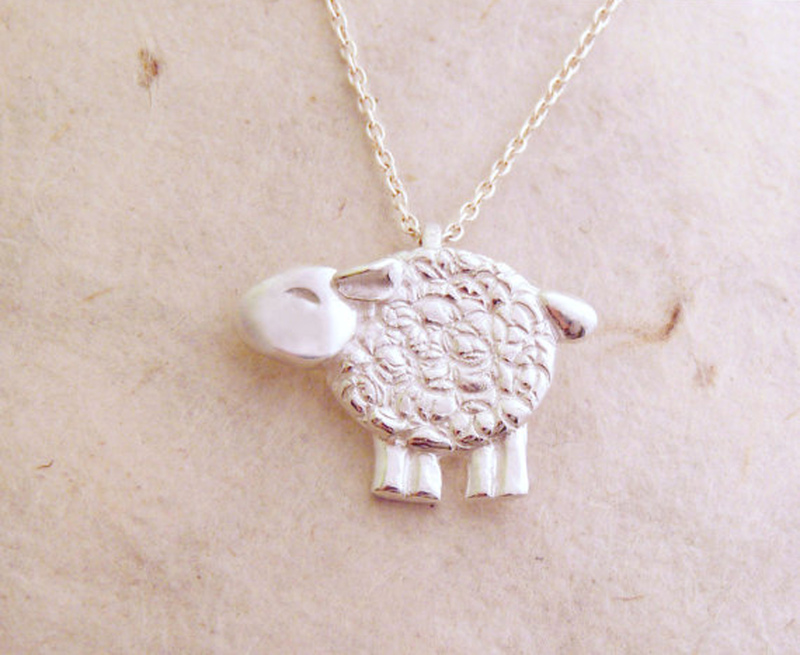 The necklace/earring sheep set was to be a gift for a girl who is showing her first lamb this week at their county fair. How exciting! Which made me realize, alas, it’s been far too long since I’ve been to a county fair. I really love them. I’m allergic to so many animals — sadness — so the fair in a way served as my big summer animal fix. Also, the bigger the animal I hang around the less of a need I felt to take one home. Although the rabbits always captured my heart. I always wanted to take one or five with me. 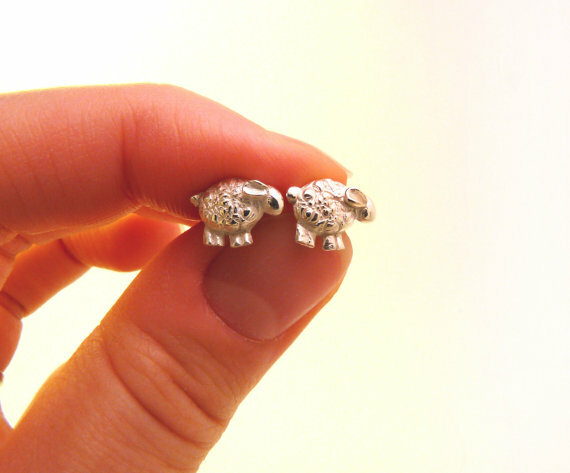 So, here’s to big real animals and tiny silver animals! I recently conquered soldering with a small torch. These were the result, as custom ordered by a friend. He requested a Jackson Pollock-esque background, and when translated to silver, the result was something akin to what I though the surface of the moon looked like when I was six. I feel very accomplished now that I can handle soldering. It took some real try, try again energy. 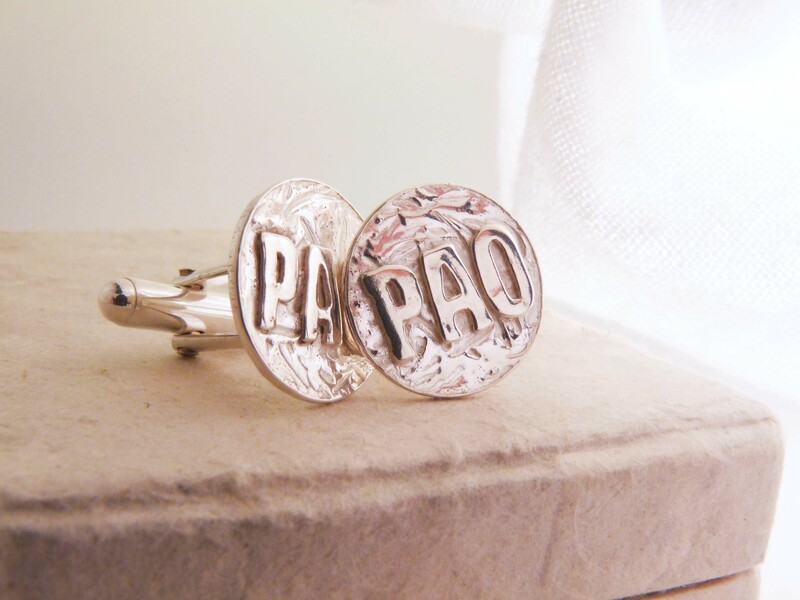 Next up, cufflinks for my soon-to-be-groom! Hopefully, the hardest part of this project will be keeping them a secret. He’s not good at saving surprises because he gets so excited, so I might have trouble keeping them from him for the same reason… he knows they’re coming. 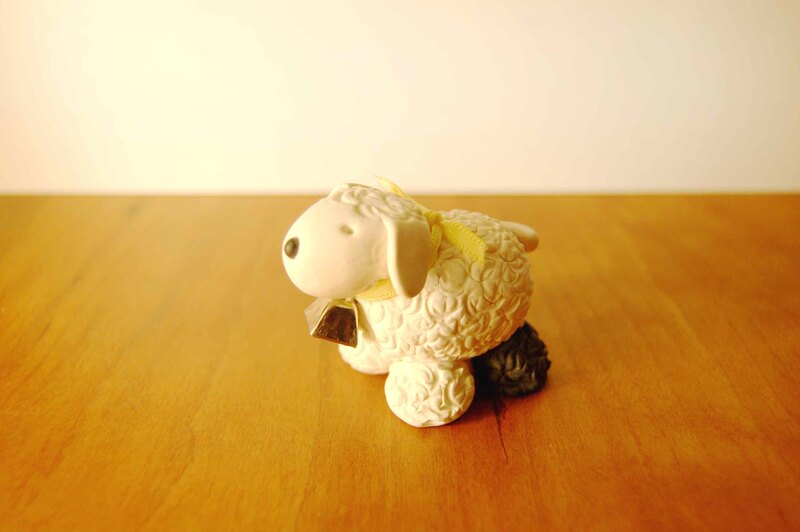 This little sheep will be a gift for a family friend who will be lending floral support for my wedding in October. She raises sheep and grows flowers. As of today there will not be any of the former at the event, although I’m beginning to reconsider due to extreme cuteness. There is something so sweet and calm about these animals that makes them seem wiser than their reputation might have you believe. I think their lesson for us would be: It’s all good! The wooly hair is made the same way I made a Sculpey sheep many years ago. I was more proud of that sheep than of most things I’d made at that age, and I remember thinking that one day I’d like to find a way to remake the sheep in a more permanent medium. That first one had a real bell around its neck. This one is permanent! That’s a funny but applicable word for silver. I might be a loon for starting this blog with the days-to-wedding countdown measurable as “dozens.” This is a realization I just had, which is why I’m distracting myself from the to-do list I can’t tackle at this hour with writing until I can sleep. Wired. The wedding planning process has been enjoyable and steady, but I think it’s time to hop to it. I’m unsure yet about when to put the shop on vacation. I have more orders than ever, including exciting custom ones that challenge me to problem solve. I have trouble putting it down! So thank you. Bring it on! Update: I found a photo of the first little sheep. I took this at Christmas when I was home in Portland. I dug out my oldest Sculpey guys. It was like a time capsule. I first made jewelry from precious metal clay in June of 2011. I knew from opening the first package of clay that this was something I would enjoy so much that I was going to have to remember to stop and sleep. I was in love with the possibilities, the idea that the only restrictions on what could be made were the limits to what my hands could create. Into the kiln the fragile little pieces would go, and out would emerge a permanent, real-life piece of fine silver. It felt like magic. It still does! My favorite evenings are still those when jewelry is the only thing on the agenda. My work is inspired by shapes and textures in nature, as animals are my first and forever muses, and I take custom requests, the best of which join the permanent offerings of the shop. Some of the most inspired ideas come from clients. One of my favorite parts of selling jewelry is that people so often tell me for whom they are ordering gifts. This is such a joyful and interesting part of the process. Jewelry can be beautiful, quirky or dramatic, but we wear it for how it makes us feel and the significance it carries. One pendant, a mountain goat, was commissioned as a good luck charm for a future climber of Everest. Another, a tiny plane, was to be a gift for a friend who had just earned her pilot’s wings. And we love them too when we buy them for ourselves. 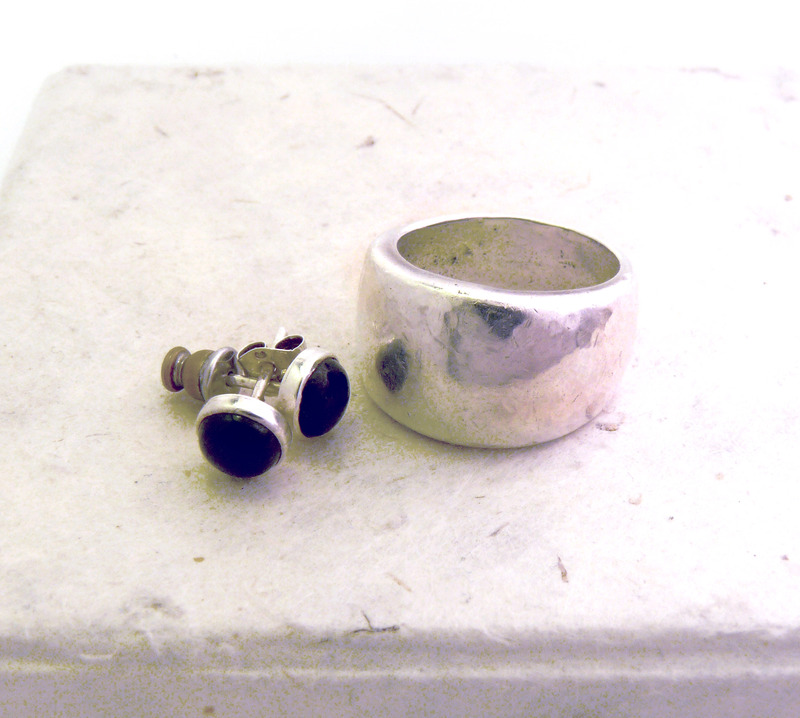 One of my favorite pieces are a pair of black jade stud earrings that I found in a tiny gallery in Antigua, Guatemala. Jade comes in many colors, each of which has a different “power,” and black is meant to guard against negative forces or entities. I call them my power earrings, because of how I feel when I wear them… powerful! Another favorite piece is a large sterling silver ring that I purchased for myself as I was becoming a single woman for the first time in my adult life. It was tumultuous time that turned out to be the beginning of many significant changes. My power ring! And of course, also the ring that symbolizes that I will soon be married to the love of my life. It is a beautiful ring (picked out by the man himself) but the meaning makes it a big deal. So I’ve started this blog to document those stories, and other shiny odds and ends. I make jewelry, and I love to hear your jewelry stories.